I’m a huge fan of used book stores and vintage books. I’ve even written about purchasing older books just for the cover art. I decided to challenge myself to read the books, some of which have been quite a challenge as they are written for the 14 -16 year old book reader of the early 1900’s. Not shown, Mammy doing the work that allows the others to make candy and study for college! I was enjoying the books at least from a historic perspective until I came to “Three Little Women at Work” by Gabrielle Jackson. 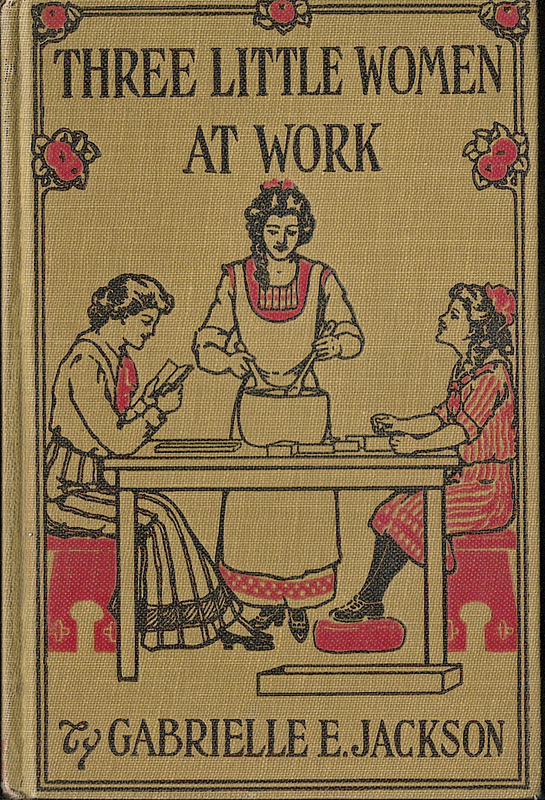 The cover is rather cute, three young women sitting around a table. The middle girl, Constance, is making candy. The younger is packing the boxes of candy. The third is reading a book as she is going to go to college. The family has fallen upon hard times as their father died and their house burned down. However, the children are all pulling together to make sure the family survives. This is a book Libertarians would enjoy, as self reliance I thought was going to be the theme. Before social security, what did happen when the bread winner died? Making candy and selling it was one option, how they get the rest of their money to survive is never quite defined. Non threatening….they love working for white people! to support their widowed mother. The book is almost impossible to read as it features “Mammy” the ever loyal servant. Mammy was at one time the family slave, and has stayed with the family through thick and thin. She is also a stereotype. I can’t help but think that in 1909, when the book was written, Mammy was exactly the type of minority people were comfortable with. The problem with this book is so much of it features Mammy and I can’t understand what she is saying. The dialect as written is almost impossible to decipher without saying it out loud. Mammy uses the N word a lot. None of the white “folks” use the N word, but they do find it amusing when Mammy does. From what I could tell, Mammy is the still ever loyal ex slave willing to die for her white family. The non black characters have the dignity of their dialogue being written in a normal fashion. The fantasy aspect though, of what a “good black person” is comes through though. “Mammy, I have never seen you look so well,” said Mrs.Carruth, patting Mammy gently upon her shoulder with a hand still soft and snowy white, preserved in all its beauty by the devotion of the old colored woman who would not hear of her using it roughly. That’s right, no need to widowed mom to ever have dish pan hands. Mammy is more than willing to do all the work. Because that’s just how wonderful she is, she LIKES having dish pan hands so her ex owner can look good. Mammy, while technically free, happily chooses to keep her role as servant/slave. I had to stop trying to read the book when I got to the chapter entitled “An African Wedding” where Mammy and Charles, another former slave, are married. My blood pressure couldn’t take it. Charles is shy because… well I’ll let the book explain. But in spite of all, Charles was utterly, wholly and entirely miserable. many years had passed since he had been a house servant and closely associated with white folk. My first thought was “Charlies run away!” I found myself “utterly, wholly and entirely miserable” just reading this chapter. I had to remind myself that the author was simply writing a comedic character, that was also the comforting fantasy of how white people wanted black people to behave. Lots of laughs and lots of work. I was determined to plow through the book, but with chapters like these, I felt it wasn’t worth the effort. Mammy, and her devotion to her white family, and their gratitude to her, is what this book is about. Sadly, it’s a fantasy of the “good black”. The white family adores her, I also would adore anyone that moved in and cooked, cleaned and was basically a robot. Mammy is simply an early version of a “Stepford Wife”. Mammy is described as “hard working” over and over. She is 60 years old in the book, which in 1909 was quite old, and yet she gets up early to do the laundry even on her wedding day. The white folk of course express how wonderful she is she “insists” on doing this. The most annoying part of the book though is how the whites joke about how they have to “handle” people of her “race” as they are so emotional. There is a good deal of joking at her expense, and the whites exchanging tips on dealing with blacks and their peculiarities. Over and over the white family lets Mammy know how much they love her, as if being appreciated is all any of “them” really want or need. They LOVE Mammy. As long as she stays Mammy. Fantasy Mammy is funny, loyal, hard working and not a threat at all to the whites that simply must help manage this emotional work horse. I finally put the book down. My husband is relieved I’m not shocking him by calling him over and reading bits of the book to him in an attempt to figure out what the heck is being said. Yis, dat’s de suah livin.right name fo’ her. You’se done hit it. she’s all mother, an’ ain’ fitten ter be nothin’else. her place is right hyer in de home wid he chillern, an’if I kind holp it she ain’ never agwine to go ut of it. She’s de haid, she is, an’ de mistis. I ain’ got no use fer dese hyer twenty-centuries women wha’ everybody’s talkin’ ’bout now-a-days, an’ wha’s spilin’ for ter hike ter de polls and vote. Gawd-a-mighty! wha’ ma old Massasay ef Miss jinny ever is ter go a -consortin’ wid de trash I’se done seed naging’ roun’ some of does places. He get right straight outen his grave an’ come and bang me slap side de haid fer not lookin’ atter her like I ouhter. (Actually after I did figure out what the author had his character saying I was rather sad I understood it). This fantasy, continues today though. There are the “good blacks”, which means they don’t scare white people. I’ve heard too often “he’s a good worker, for a black guy.” I have even heard “Well, you know, look how emotional they get in church. They just can’t control themselves.” (People rarely say these things to me more than once, I reply back in a ways they don’t appreciate). Growing up in the 60’s and 70’s, there were “good black people”, which meant as much like white people as possible, and then there were the black people that made people nervous. Very nervous. Sidney Poitier= good. Malcolm X= bad. 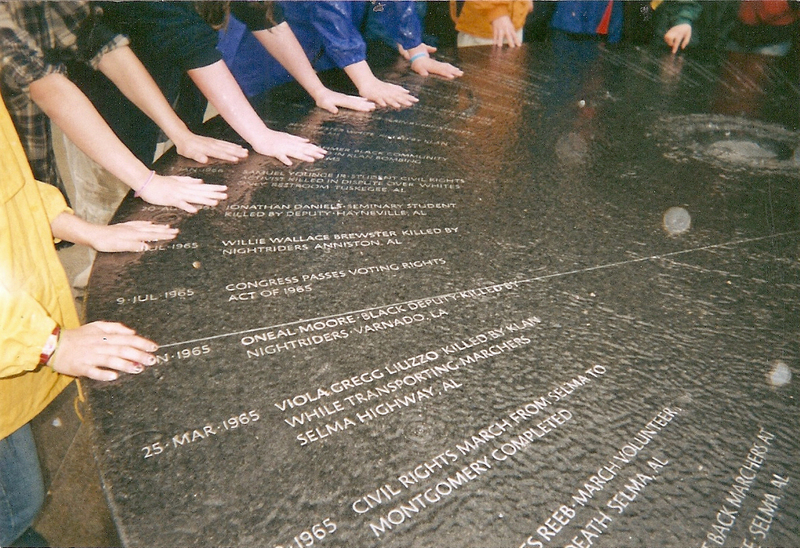 My daughter’s class for the 8th grade school trip traveled to many historic Civil Rights sites. It was an eye opener for a small class from Vermont. I was lucky enough to belong to an Episcopalian church that worked for Civil Rights and living near DC was like having a front row seat during a time of great change and drama. Thankfully, the church took the time to really address what was going on around us. The need for change, the need to march, the need to stir things up. I remember Father Taylor giving a sermon in which he pointed out the job of black people was not to make white people feel comfortable. It was the job of all of us to secure equal rights for all races and people. This included women and gays, which was rather bold even for the Episcopalian church of the 1970’s. Attempting to read this book was an eye opening experience. It may have been written over 100 years ago, but there have not been enough changes. When I think of the recent “Duck Dynasty” and Paula Deen incidents, I see that as Father Taylor said so long ago, it’s still the job of all of us to secure equal rights for everyone, even if they make us uncomfortable! ‹ Pecos Texas needs a Valium badly….